Anoop Chandola, an American linguist-anthropologist, was raised in a priestly Brahmin family in India near the Nepal-Tibet border. Dr. Chandola, a graduate of the Universities of California-Berkeley and Chicago, has taught Indian literature, culture, and religion at S.V. Patel University, M. S. University of Baroda, University of California-Berkeley, University of Washington-Seattle, University of Texas-Austin, and University of Wisconsin-Madison. 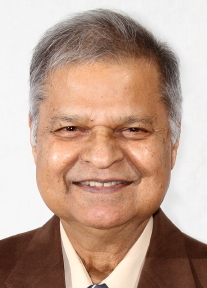 He is a member of the American Anthropological Association, Association for Asian Studies, Linguistic Society of America, and Linguistic Society of India. Dr. Chandola, now Professor Emeritus of East Asian Studies at the University of Arizona, lives in Tucson with his wife Sudha. He is a frequent guest lecturer on Hinduism and related religions.